5 BEDROOM, 3 BATHS, SCREEN PORCH. 8 ROOMS HAVE DIRECT ACCESS TO TWO LARGE DECKS. We welcome extended families searching for necessary restorative time with plenty of space, inside and out to relax and enjoy each other. There are many quiet places to pursue a novel found in one of our bookcases. If you crave peace and quiet, this is the home for you. Please phone me @ 270-871-9154 as i always like to speak to potential Guests. Our spacious luxurious home is located on a large double lot at the end of a quiet road and has all the amenities for you to relax, unwind, escape the ordinary and enjoy the change of pace you deserve. Privacy galore. East of us is a wide open yard with lots of play space for everyone to enjoy. Easy access for all vehicles, boats and trailers via our pull through driveway in front of the house. For your convenience there is also extra vehicle parking plus a driveway down to our private covered dock just East of our house. Feel free to take your supplies directly to our dock for a day on the Lake Barkley via your vehicle. Driving to our private dock is an unusual convenience that we know you will certainly enjoy. Get far away from the stress and demands of everyday life and surround yourself with nature and people you love in our perfect hideaway. Our back lawn slopes gently down to our private covered dock which features one covered slip for your use, plus two extra tie up areas on either side of the dock. It is a fun place to gather for swimming and/or fishing. A spool table is provided on the dock for fish cleaning. There is a ladder to the water at the end of the dock for the swimmers in your family. The lake is shallow with a sandy bottom near the shore and gently slopes toward the end of our dock. Gently sloping large yard for volley ball, corn hole, three legged race, water balloon toss, or your favorite outdoor activities. Bring your favorite yard games. Our fire pit on a round, fenced patio is popular for roasting hot dogs and of course enjoying s'mores. Firewood is provided (stored under our large oak tree) and roasting sticks are located in the kitchen pantry. Catching lightening bugs is also a summertime favorite activity for the youngsters of all ages. Some of our guests have never had the chance to pursue this fun summer evening activity. It's a memorable, unique experience if you do not live where beautiful lightening bugs abound. Our large cement driveway is also a good game area for lots of fun. If you use sidewalk chalk, please bring equipment to remove the chalk before leaving. We want a 'clean' driveway for our next guests. Morning coffee on the screened porch is a wonderful way to start your day. Our two (2) large decks, overlooking Lake Barkley, with direct access from eight rooms, give you a true 'outdoor living' feel. They provide great gathering places in the comfortable deck and lounge chairs provided. Main level: Accessible with one step into the house. Foyer table with a welcome note for you to peruse. Desk for your laptop with hi speed internet provided. Case sensitive wifi access code is in the guest book. Local maps and area information in the desk drawers. Bring your iPad or iPhone and listen to your own music, or enjoy music via the TV on the terrace level. The first floor also features a King suite with private bath and access to deck. Two queen size bedrooms. Hall bath with large vanity and tub/shower. Large living room with comfy couch and love seat, lazy-boy and rocking chair for quiet relaxation and conversation. Bookcase in the dining room full of puzzle books and reading material for all ages. The completely equipped kitchen has a large refrigerator with freezer and ice maker. Another full sized refrigerator is steps away in the garage. There is also a garbage disposal, double waste baskets, dishwasher, microwave, wall oven, ceramic cook top, Mr. Coffee and filters, electric hot water kettle, blender, toaster, crock pot, large electric griddle plus numerous large pots, large roaster, sauce pans, cake pans and cookie sheets. Large empty pantry shelf and several cupboards in the dining area for your personal supplies. Dish detergent, paper towels and napkins, plastic bags and foil, and some staples are available for your use. Check out the cook book in the glass cupboard in the dining area filled with delicious local favorite recipes. Liquid body wash is provided in each bathroom, if you prefer, bring your favorite bar soap. Laundry room off kitchen with iron and ironing board, and some laundry soap provided. Kitchen stocked with colorful dishes, silverware and glassware. Seating for 14 at two tables in the large dining area. Two extra folding chairs in the front hall closet. Two high chairs (stored in front closet) a youth chair also provided. Access to the screen porch and deck from kitchen dining area. Two pack and plays, with linens, for the babies in the family. Bedroom # 4 with queen bed and deck access. Bedroom # 5 with two twin beds and deck access. Outside is a favorite retreat...a porch swing facing the lake. Hall bath with 'rain' shower head and separate vanity. Large family room with 47-inch satellite TV and DVD. Wood burning fireplace (some kindling and logs provided). Snack bar with sink, small fridge and gas cook top. Game closet with jigsaw puzzles, decks of cards, sketch pads and crayons, and numerous board games for all ages. Large toy trucks, doll basket and baby blankets for toddlers play time. Game/play room has couch with a full size hide-a-bed. Linens for the bed are stored in a small white wooden chest nearby. Foosball table, round game table with 4 chairs ready for your favorite card or board game. Another book case with reading material for all ages. Private 'SPA' room with double whirlpool tub for your pleasure. Towels, for inside use only, provided. Double garage plus level parking for several cars on large cement circular drive through driveway in the front of the house. Extra parking on our large lot East of the house. Access to dock via your vehicles is a huge help in loading supplies for a day on the lake. Numerous lounge and deck chairs for reading, relaxing and dreaming on the decks. A new porch swing, facing the lake,is a favorite spot on the terrace level deck Very quiet, private setting with large, expansive yard for outdoor enjoyment. Large gas grill provided on deck next to screened porch. Grilling utensils, baskets and marshmallow/hot dog forks in the pantry. Extra full propane tank in the garage. Cattle and blueberry farmers in western Kentucky, not far from Lake Barkley. This home fulfills our dream of owning waterfront property on beautiful Lake Barkley. We intend to use this property in our lifetime and have created a trust to pass it on to our family and hope that it will provide years and years of fun and togetherness for all og them.. It is large enough to accommodate 3 and 4 generation reunions and cozy enough for the two of us to spend quiet time alone. After extensive shopping, we finally found a home in a small quiet neighborhood that did not require any steps to reach our own private covered dock with electricity. With a gently sloping expansive lawn leading to the water, we definitely were interested before we even stepped inside this spacious custom built home. To further assure our privacy, we bought the lots East of our home and now have a unique, expansive very private playground We had casually looked at waterfront property for years and had a list of 'must haves', that we would not compromise on. This home fulfills all of our desires: solid construction, within an hour from our farm home, good major road access, quiet and sparsely populated neighborhood, gentle slope with no steps to the lake, large private,electrified covered dock, southern exposure, screened porch, ideal spot for a fire pit, expansive decks with comfortable lounge chairs, a porch swing and a view of lake from all the major rooms for easy 'outside living'. Furnishing the home was a labor of love. Using Ellen's handmade quilts, and her sewing expertise plus solid wood furniture, much of which has been refinished by David, furnishing our home is an ongoing project. We are able to use what we both love creating and enjoy knowing our guests appreciate our efforts. Truly the ideal family vacation home for our children and grandchildren. We know how much fun we all have as we gather here for our annual reunion. Now we are sharing this unique home for those who appreciate a comfortable lake home to unwind and enjoy quality time with family and friends. I know you will enjoy our home as much as we do. We appreciate the reviews we have received and look forward to hearing from you. Main level. King Suite split bath: Vanity with separate commode/shower room. Hair dryer, shampoo and liquid soap, extra toilet tissue and Kleenex provided for your convenience. Main level. Large vanity with tiled tub/shower. Hair dryer, shampoo and liquid soap, extra toilet tissue and Kleenex provided for your convenience. Terrace level. Vanity with separate commode/shower room with unique 'rain' shower head. Hair dryer, shampoo, and liquid soap, extra toilet tissue and Kleenex provided for your convenience. Large absorbent bath towels, hand towels and wash cloths in each bathroom. Please bring your own beach towels. Direct access via gently sloping lawn to our own dock in a quiet cove. Room for 3 watercraft, one covered. Great fishing from the dock. Shallow water for playing, and ladder to climb back onto dock. Central air throughout the house. Two thermostats. One on main level and one on terrace level. Central heat with two thermostats. One on main level, one on terrace level. New top loading washing machine. Some detergent provided. Please read and follow instructions on lid of the washer. Yes, 2! New gas dryer in laundry room. Another electric dryer just steps away in garage. Two car garage. Direct access to kitchen via one step. Access to back deck with large gas grill for your use. Bring your lap top, iPad or iPhone and use our wireless hi-speed internet. Password is case sensitive and listed on the "Welcome'' note on the clipboard in the Foyer. Large, absorbent bath towels, hand towels and washcloths in each bathroom. A few towels for use in the Spa room. Please bring your own beach towels for use outside of the house. Yoga mat in the game closet, terrace level. Furnished with lazy-boy rocker/recliner/swivel chair. Couch and love seat and several chairs. Dining room has book case full of reading material for all ages. Puzzle books for your pleasure, too. Detergent pods provided. Most pots and pans are dishwasher friendly to make your clean-up as easy as possible. Large refrigerator/freezer with ice maker in kitchen. Another full sized refrigerator/freezer in garage, just steps away from kitchen. Small refrigerator in snack bar on the terrace level. Built in electric oven. An electric griddle provided for a family friendly pancake breakfast, or an easy and delicious meal of grilled cheese sandwiches. Mr. Coffee and filters. Bring your favorite brew. 2 slice. How about a toasted English muffin with that cup of fresh brewed coffee? Main level. Dining room book shelf. Terrace level. Book shelf in the game room. If you 'get into' one of our books and don't finish it during your stay feel free to take it with you and pass it on. Terrace level. Foosball table, round table and four chairs ready for cards or games. Please "pin up" your art work on our 'one a kind baby bed spring bulletin board' with the clothes pins provided. Numerous board games for all ages. Several decks of cards in the game closet off family room...terrace level. Also, decks of cards in foyer desk drawer on the main level. In terrace level game closet, some big trucks for little tykes and a dolly basket and blankets too. Art supplies and games galore. Life jackets for most all ages in the terrace level hall closet. A few 'old' classic movies... You might want to bring your favorites. Double lot with large flat grass area for all of your games. Numerous lawn & lounge chairs on screened porch, two decks and round patio. Move chairs where needed. Porch swing on terrace level deck. Double deck overlooking back yard and lake. Rentals within 4 miles at full service marinas. Ski-do rentals between mile markers 1 and 2 on Route 274. Main level: Large deck accessible from MBR , Living room, Kitchen/ Dining room. Terrace level: Covered deck accessible from BR#4 and #5, family room and game room. Round patio with fire pit, too. Various sized life jackets in the hall closet on the terrace level. If you use them, please return them to the closet. Nearby at Lake Barkley Park 10 to 15 minutes away. Booths Randolph course at Lake Barkley Park 10 to 15 minutes away. Main floor accessible with one step into home. If you enjoy peace and quiet, then our private setting fits the bill. You can be as active or passive as you desire. You almost feel alone as you cannot see another neighbor from any of our numerous windows. Wildlife watching is a fun pastime with abundant deer, birds and water fowl. Pelicans on the lake are fascinating to observe. You will see the evidence of beaver activity these past winters A great place to relax and do nothing. Truly a 'vacation' home. We are 1/2 mile off of the main road, with an easy commute to a convenience store and small restaurant about three miles away. Six miles to the local Subway. Seven miles into Cadiz, a friendly, unique small town with restaurants, grocery stores, library, ATMs, churches and many antique shops for your enjoyment. A variety of water craft rentals are available within four miles of our home. You are welcome to tie up at our private dock. Great fishing right off our dock. Trolling fishermen are common in our cove. This is the 3rd year we’ve rented Our Triggwood for our sibling reunion. Perfect house for 5 adults. 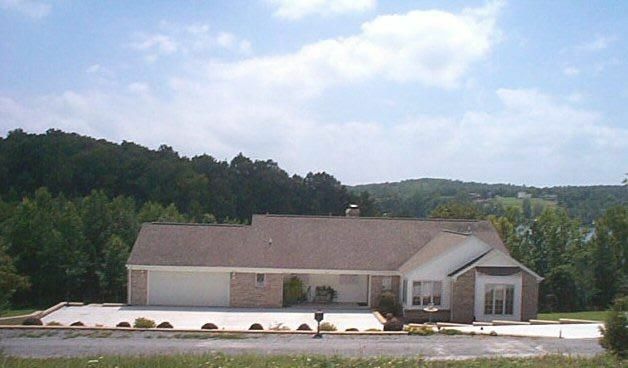 The house is clean, well equipped, and has wonderful lake views from the quiet private deck. Ellen is very easy to communicate with and was quick to accommodate our needs. This house was amazing! Very large, wonderfully equipped for our big group, very clean! Our entire children & grandchildren came from the Chicago suburbs & Florida for our bi-annual vacation. We were delighted at how large the home was and how well equipped it was. The kitchen was stocked with virtually everything we needed from dishes to utensils to electric devices, griddle, etc.! I have never rented a place previously that was so well provided, even things like hand soap, bath soap, shampoo, toilet paper, paper towels, nice bathroom towels, etc. The porches were lovely; we enjoyed the fire pit with s'mores and star gazing (amazing! ); loved the screened-in porch for coffee & wake-ups first thing in the morning. The kids spent most of their time in the water and enjoying the dock, but no luck with fishing (I think they scared them all away)!!! Everything was clean and well maintained. We saw deer every morning & evening, even some that came fairly close to the house. It was peaceful and relaxing. Not the best signal for electronics use, but we made do. Thanks, Ellen & David, for sharing your lovely home. We will certainly recommend it to anyone traveling to this area. Wow, sounds like you enjoyed it as much as our family does. Bringing extended family members together is what it is all about, and love to hear that you all had a wonderful time. Now we know for certain all the touches we look for when we travel are also appreciated by our guests. We do appreciate your response. My large family stayed at this property in June and had an absolutely wonderful time. The house had everything we needed was clean and well kept. We plan on staying at this property again. Thanks, Annette, for taking the time to let us know you and your family enjoyed your vacation at our beach home. Wanting to return says it all... We look forward to you and others who feel so comfortable that they become our guests again and again. We continue to add new furnishings and amenities that we feel will make our guests leave with wonderful memories of their visit to our 'home away from home'. The house accommodates a large family! The kitchen has all of the essentials and then some. The dock is perfect to jump right off and enjoy lake Barkley. Land Between the Lakes is very close by and has several attractions for families. We truly enjoyed our stay. Thanks, Angela, for letting us know how much your family enjoyed your vacation on Lake Barkley at our home. Spending quality time with family and friends is priceless. Happy you let us know our home fulfilled all your expectations. Great place to stay on the lake! This lake house has everything a large family needs: space for everyone to breathe, good sized bedrooms, well-stocked kitchen, porches everywhere. The owners communicated well and were very helpful with questions. The house has its own dock and we were able to rent a pontoon and pull it right up to the dock. The house is on an inlet of Lake Barkley so it was nice to be out of the busy Memorial Day lake traffic as we swam and attached a tube to the pontoon. Would definitely stay there again! Thanks, Jeanne, for letting us know you enjoyed visiting our lake home. We appreciate your feed back and taking time to let future guests know "what you see on our web site is what you get" in our home. We love our quiet cove, it was definitely a must when we were looking for a home on Lake Barkley. It has proven to be a wonderful decision. We look forward to having you and your family visit again. If you are looking for a place with everything you might need for a lake vacation this is for you! It is the last house on the road, so there is a lot of privacy as the lots past it have nothing on them. The picture you see of the back is accurate - it is nicely mowed down to the lake and the private dock, which has steps that you can lower down for swimming in the lake. The two decks are long and roomy. At the end of the top deck is a screened in eating area right off the kitchen. There is plenty of outdoor furniture available for lounging on the decks. The inside of the house simply had EVERYTHING we needed. The listing is very accurate - the property is clean and well maintained. I was in contact with the owners by text while there - they responded quickly. I would recommend this property if you have a large family that wants to vacation. You won't be on top of each other - there are so many places to hang out - including the fire pit area! There are 5 official bedrooms, but the game room in the basement is off by itself and has a pullout couch that could easily be used as another private sleeping area. The property is about 5-6 miles from the Subway in Cadiz, I believe. It may seem like a drive if you are a city person, but to get this lake experience you've gotta take a small drive. We spend a lot of time in Cadiz so here are the places we like or go to. 1. Lake Barkley Lodge - love the buffet which changes nightly and is only 9.99 on Frida (fried fish night) and I believe Saturday. Best mixed veggies ever! I would eat there every night for dinner if I had my way. 2. The Cabin - A little coffee ship in downtown Cadiz, sort of pricey for what you get but very good food. 3. The Antique shops, downtown Cadiz - I love to go here on my visits. Don't forget to go down to The Purple Pig - it is a block down from the two large antique malls. 4. Triplett's Barbecue - Out by the interstate, this is some very good BBQ, but every time we go they have a different set-up. It is fairly new and I'm thinking they haven't gotten in the groove of what works best. But the food is tasty. Also a pricey, but they have a new menu and some less expensive items now. 5. The Land Between the Lakes - Beautiful drive and outdoors area for those who want to explore. 6. Elk & Bison Prairie - We love to drive through this and look enjoy the wildlife. 7. The Lakes - are just beautiful with numerous activities/rentals of all types available. Thank you Kay, for your prompt and gracious review. You mentioned a couple restaurants we have not had a chance to check out but will do so soon. We too enjoy the buffet at Lake Barkley Lodge. I like the varied stations, i.e., soup, cheese and salad bar, several meats and vegetables, fantastic desserts and even ice cream cones! If you want a cook-free meal, it is a wonderful place to gather and enjoy the activity on the lake through their floor to ceiling windows. We appreciate all your input and we want to also express our appreciation for you taking good care of our home. Come and enjoy easy access and plenty of parking on our pull thru driveway. Additional parking and access to the lake and our dock in your vehicle just to the East of our spacious double lot. Tons of privacy to enjoy our tranquil setting. 10 minutes to Cadiz, a quaint small town with numerous antique shops, grocery stores, variety and liquor shops. Decorated pigs on main street displayed year round reminding folks of the annual Ham Festival weekend every October. A fun time for perusing various vendors with crafts, and food galore. Churches of many denominations, too. About 50 minutes to Paducah, the quilt capital of western KY, with the American Quilters Museum and many wonderful quilt shops and excellent restaurants. 15 minutes to Lake Barkley Resort Park by car, 5 minutes by boat. Lake Barkley Restaurant is always a wonderful place for delicious meals in their Lakeside dining room. The Marina has a casual dining room. The Lodge and the Marina are accessible via land or water. Land between the Lakes, & KY Dam Village nearby. Princeton with multiple antique shops and Adsmore Historic Museum Home is just 30 minutes away. Spacious enough for a large family, cozy enough for a small group. Who can resist enjoying a few hours with a good book and perhaps a snooze on one of our decks? Our zero gravity deck chairs invite comfortable lounging. The annual Trigg County Ham festival in early October is a wonderful time to visit and experience the small town atmosphere of Cadiz with numerous craft booths, and delicious food of every description. The usual cool Autumn weather and colorful trees make it a great destination for a unique, fun week-end. Our home is a quiet haven any season of the year. The perfect destination to use for rest and relaxation. FYI: Service Fee attached to you quote is from VRBO which is solely responsible for it. We do not endorse it nor do we gain monetarily from it. Before this booking is finalized, I would like to talk with you. Please list your phone/text number so I can contact you, or call/text me @ 270-871-9154. First payment will be fully refunded if cancelled 60 days prior to check-in date. 50% refunded if cancelled 30 days prior to check-in date. No refund if cancelled within 30 days prior to check-in. If a cancellation is necessary, depending on the circumstances and availability of VRBO #556394, it may be possible to reschedule your visit one time at the prevailing rate for any available dates within one year.